Here is another picture with window reflections. This one shows other walkers out at lunchtime. This photo, like the previous one, was taken on Federal Street near South Station. 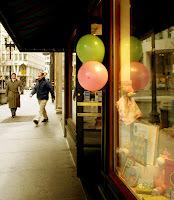 What caught my attention about this picture were the pink and green balloons (Easter colors) outside the shop inviting people to stop in and buy something.